The book discusses and analyses how the Victorian Football League (VFL) kept its competition going during both twentieth century world wars in the face of public criticism and logistical limitations. The League was in good shape in 1914, its 18th season since breaking away from the Victorian Football Association (VFA). Record-breaking attendances the previous year had affirmed its popularity. In August Britain and Germany went to war. Australia’s links to Britain and the Empire were still very strong, however there was a significant number, particularly those with an Irish heritage, for whom those ties were frayed or severed. Recruitment for the war effort became a vexing issue. The VFL was not immune to this and the sentiments of Melburnians were mixed when it opted to continue its competition, albeit with fewer teams, whilst other sports and football associations ceased operations for the duration of the war. The rival body, the VFA, mothballed its competition in 1916 and 1917. The VFL had to balance its priorities – to continue while at the same time not being perceived by the public as hindering enlistments, and being seen to contribute to the fundraising for the war effort. How it negotiated these public relations minefields is not a simple narrative. A quarter of a century later, war erupted again. By this time Australia’s attachment to Britain and the Empire had begun to fade. The families of the returned servicemen and nurses from World War I were only too familiar with the suffering and loss that would take place in the new war. Additionally, the new conflict reached Australia’s doorstep with the homeland being attacked. The VFL had new issues and challenges to be addressed if the competition was to continue throughout the war. Shortages of personnel, both players and administrators, a lack of universal support, as had appeared between 1914 and 1918, and a restricted number of playing venues were the most pressing. The period 1942-43 was the most critical, for the nation and the VFL. Football grounds were attractive for military use because they provided accommodation space, with catering and ablution facilities, parade grounds and ample storage areas. With the Australian Government assuming control of manpower and resources, extra pressure was placed on the way the general populace could spend its limited leisure time. As in the Great War, it was agreed that football provided a valuable diversion from the constant focus on the war. How that consensus came about is also the subject of the second part of this book. Football history until around the 1970s focused predominantly on the most exciting eras, on successful players and clubs, and logging some of the statistics. Even since then, some of the not so captivating, but equally important history, such as footy during wartime, has been glossed over. The book had its genesis while Bruce Kennedy’s and Michael Rogers’s Classic Cats: The Story of Geelong’s Premiership Years 1951–52 was being written. The authors were at pains to find sufficient details and commentary about the factors that governed the VFL’s decision making during WWII. Further, careful attention to the sources indicated that some of the information accepted as gospel by a number of writers was not entirely correct. It was high time to construct a fresh narrative to fill the gap. Bruce Coe, whose many sporting interests include an ongoing study of the World War I period, is familiar with the same lack of robustness with regard to the Great War, and is equally committed to producing a more definitive account for that conflict. The work of the two Bruces complement each other to provide a substantive treatment of the VFL’s experiences during both major conflicts. This compilation is very much from scratch, so much of the data and detail will be new for readers. For Bruce Coe, extracting details about LA Adamson’s arguments about the distinction of amateurism and professionalism of sport early in the century, and sleuthing to fill out the details of the 1916 match in London were highlights of his research. For Bruce Kennedy, finding out the real reasons why the military took over League venues, how it negotiated guarantees of sufficient playing arenas, and the machinations associated with regaining them was most satisfying. Post and packaging outside Australia: Please email, or write to the address below. Australia’s national football code, has grown as the nation itself has grown. Much has been written about the way the code has developed since the first recorded match played between Scotch College and Melbourne Grammar School in August 1858. Those writings have focused on the game’s popularity, the successes, the personalities, club histories and the growth and development of major and some minor competitions. On the other hand, the way the code and its competitions managed during the two major 20th century world wars has received scant attention. Much has been written about VFL players who served in the armed forces during the two world wars. For instance, in Fallen: The Ultimate Heroes, Jim Main and David Allen chronicle all the VFL players who died in the Boer War and both world wars. More recently, Barbara Cullen’s wonderful and exhaustively researched Harder than Football traces the background of every VFL player who served in all conflicts from the Boer War through to the Vietnam War. 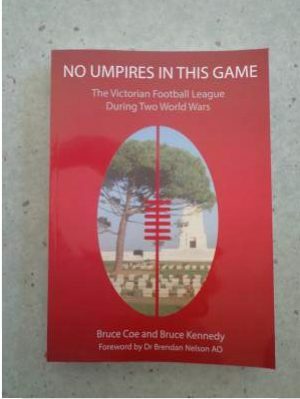 By contrast, appraisal of the structural and social impacts of twentieth century wars on football competitions in Australia is limited to Up Where, Cazaly?, in which Leonie Sandercock and Ian Turner devote a chapter to each of the two world wars, and Dale Blair’s work on World War I. These are the only substantial writings to date that consider wars and Australian football. Nothing of substance has been written about Australian football and World War II. In both World War I and World War II, the continuation of the VFL competition was threatened by wartime issues. In 1916 these were mainly social and political; in 1942 they were mainly logistical. In World War II the restricted number of playing venues was the VFL’s biggest challenge. This book brings together material that conveys the cut and thrust, and often the day-by-day drama that shaped the VFL’s responses, and how close the competition came to being unable to proceed in both wars. Whereas earlier writings demanded painstaking research of hard copies and microfilms of newspapers and other salient resources, the advent of the National Library of Australia’s Trove repository of digitised newspapers and other journals and periodicals and the State Library of Victoria’s similar treatment of The Football Record have enabled the research for this book to be more forensic. Our material is drawn from an extensive range of sources, including contemporary metropolitan and local Melbourne newspapers and periodicals which have not been previously researched. Minutes of the VFL and some of its clubs were also accessed. In addition, some records held by the National Archives of Australia provided information that has not been resourced before now. Interesting,it makes me wonder of more Questions. We know during the height of WW1, there were only 4 VFL clubs with Fitzroy finishing last, then winning the flag in the same year. Not bad. I was not cognisant of the VFA’s hiatus in 1916-1917, the years of the two conscription plebiscites. Dd they go into recess again during the second world war? What about the WAFL, SANFL and similar competitions; did they cease during the height of the war ?